Most race cars are required to have one. Most street cars don’t. Get on your lid and you’ll wish you had one. It both keeps you safe and keeps your car stiff. We’re of course talking about roll cages, and in this featured tech piece we’re going to take a look at the in’s and out’s of the basic roll cage, from the materials they’re constructed of, to where you can have one installed, what it will cost you, and what NHRA regulations you need to know before you chop up your prized vehicle and start bending and welding. To really get a good understanding of the business of roll cages, who better to sit down and chat with than some of the veterans in the industry who make their living building race car chassis and chassis components? Below, you’ll hear from the likes of Chris Alston’s Chassisworks, Wild Rides Race Cars, Alston Race Cars, and Ridetech (for the street and muscle car inclined) as they share their knowledge and experiences in this pseudo beginner’s guide to roll cages. At the surface, a roll bar and a roll cage are designed to accomplish one very critical goal — to keep the driver safe should they be involved in an accident; particularly a crash that involves the shiny side down. But as chassis builders found early on, there’s more function to that puzzle of bars than just safety, which we’ll get into later. As most of our readers know, a roll bar and a roll cage are not the same thing. Same purpose, different execution. Shown here is a visual difference between your basic 4-point roll cage and an 8-point roll cage from the Chris Alston's Chassisworks catalog. The bars shown in blue are optional. The basic, 4-point roll bar consists of a main hoop behind the driver, two rear struts, and an optional cross brace on the main hoop should you need it or the rules require it. From there, you can go with a 6-point roll bar that includes a driver and passenger side door bar, while an 8-point setup includes a pair of rear-facing side bars for extra support of the main hoop. Moving on to roll cages, you first get into the 8-point roll cage, which includes a main hoop, cage sides that route along the A-pillar, a windshield brace across the forward section of the roof, a back brace bar, roll cage gussets, and subframe struts. A 10-point cage includes rear struts and commonly an X-bar through those rear struts for torsional support. Once you go beyond the basics, you start getting into 12-point and 14-point cages and on into full tube chassis cars with Funny Car cages that fall under the SFI 25.X certifications. Today, however, we’re going to focus on your first roll cage — the basics. The National Hot Rod Association, the premier governing body in the sport of drag racing, outlines a number of requirements for roll bars and roll cages for racers competing at sanctioned tracks and events the world over, based on elapsed time and, in some cases, on speed. Vehicles running 11.00 to 11.49 in the 1/4-mile or 7.00 to 7.35 in the 1/8-mile (including those with T-tops), convertibles running 11.00 to 13.49 (7.00 to 8.25), and dune-buggy-type vehicles running 12.00 and slower are required to have a roll bar installed in the vehicle. Stepping up the performance ladder, a roll cage is mandatory for any vehicle running 10.99 (6.99) or quicker or exceeding 135 mph. In any full-bodied vehicle however that maintains an unaltered firewall, floor, and body running between 10.00 and 10.99 (6.40 and 6.99) a roll bar is permitted in place of a roll cage. 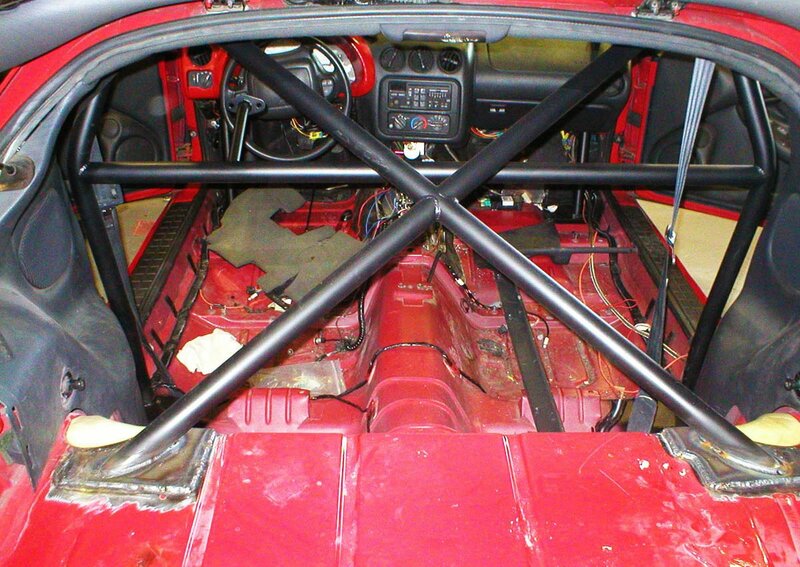 If you’re working with a car with an OEM frame, the roll bar/cage must be attached to the frame, while in unibody cars (which make up most late model cars), a 6-inch square steel plate measuring 1/8-inch thick must be welded to the floor as a base for each bar that makes its point of contact inside the car. Bolted-in bars require a pair of 6-inch steel plates — one underneath and one above, with four 3/8-inch bolts through the rocker sill to hold the two plates together. Digging into materials, all tubing has to measure 1-3/4-inch outer diameter, with mild steel .118-inch thickness and chromoly .083-inch. Swing-out side bars, popular for many cars that will be driven on the street and climbed in and out of, are permitted on cars running 8.50 and slower, with a number of caveats in terms of the clevis, bolts/pins, and more. The NHRA, in conjunction with the SFI Foundation, has put in place mandates for welding processes that must be used on both mild steel and chromoly. As well, plating and grinding of the welds is expressly prohibited. 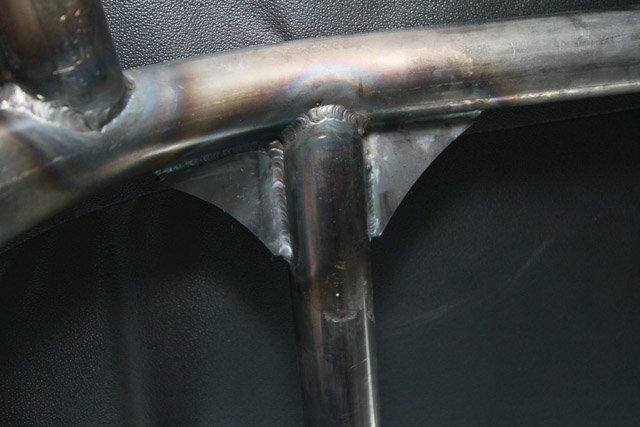 All roll bars/cages constructed of 4130 chromoly tubing must be welded using an approve TIG heliarc process, while mild steel must be done with an approved MIG wire feed or TIG heliarc process. Grinding and plating of the welds is prohibited, so keep these points in mind if you’re a do-it-yourselfer. The 2012 NHRA Rulebook has 12 pages in the General Regulations section that pertain to frame requirements, which is far more than we could ever outline here in detail. If you’re considering building a roll bar/cage yourself, we’d suggest if you’re not already an NHRA member, to either get yourself signed up or pick up a copy of the NHRA Rulebook, which is available for $10 from the NHRA Store online. Your choice of material for a roll bar/cage comes down to one of two options: mild steel or chromoly. Each one, when built within the specifications of the NHRA rulebook, offers the same amount of strength and protection. What it really boils down to then is a tradeoff between cost and speed. How fast do you want to go? By nature and pound for pound, chromoly is a stronger material than mild steel, and that allows for chromoly to be a thinner wall tubing (.083″ compared to .113″). This gives chromoly a distinct advantage in terms of weight, but that advantage comes at a cost that customers must weigh (no pun intended) before they build. Mild steel is far less expensive than chromoly, but comes with the disadvantage of more weight. For the grass roots racer on a budget that we’re targeting here, that cost versus weight decision can be a big one. For comparisons sake, using a 12-point roll cage from Chassisworks as an example, the mild steel version will tip the scales about 50-60 pounds heavier than the chromoly, according to Wright, but is nearly double the price. As pointed out above in the NHRA regulations, the minimum wall thickness on mild steel is more than that of chromoly to achieve the same result, and that is because, by nature, chromoly offers more strength pound-for-pound, so to speak. 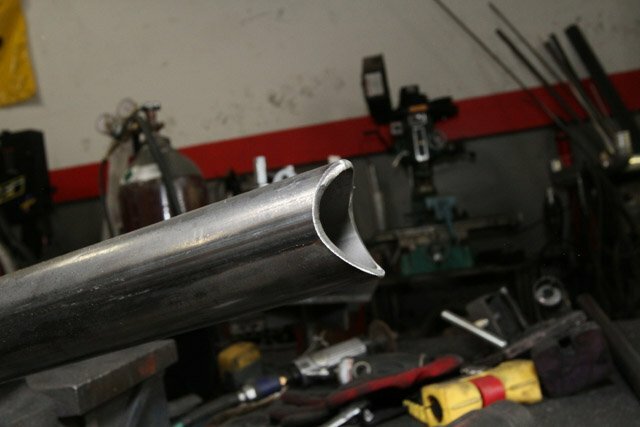 “Some people say ‘well chromoly is stronger’, and it is stronger on its own, if you took equal tubing of the same wall thickness and tested them side-by-side, but they’re allowing you to run a thinner wall thickness with chromoly to save some weight and still equal the same structure, strength-wise,” explains Gene Giroud of Wild Rides Race Cars. The primary means of a roll bar or cage is to protect the driver, but barring such an incident, those bars will serve a daily purpose of stiffening the entire vehicle up and creating less body roll and twist. Each bar added to a roll cage adds another dimension of structural support and rigidity. For example, the X-brace shown here is not only stronger than the straight rear struts, but also provides added torsional strength to the car. The downside, however, is that the X-bar essentially eliminates your back seat. The benefit of a roll cage is really two-fold. It’s designed to protect you first and foremost, but the every day bonus to the existence of a roll cage is improved stiffness of the vehicle, and that’s a big plus for drag racers planting the tires to the ground. Adding more bars to a roll bar/cage not only adds to the structural integrity from a safety standpoint, but each additional bars presents more rigidity to the chassis. “The more points you put in the car, the stiffer the platform of the car is going to be. And if you put an “X” in it for example, that’s going to make it even stronger,” says Mike Ruth of Alston Race Cars. “And the more horsepower and torque you have, and the better ‘bite’ the car gets, the more it’s going to try twisting on the launch, so more bars you add the more rigid the chassis will be.” By maintaining that stiffness within the body and chassis, the shock and suspension tuning adjustments that you make will deliver results you can truly see. Something to keep in mind when you’re in the market for a roll cage is the fact that what’s designed to save your life in a dedicated race car isn’t necessarily optimum for a car that spends all or most of its life on the street. Most chassis builder, including those we spoke with in this article, generally build their roll bars/cages to NHRA specifications regardless, but these chassis builder also know there are safety discrepancies between a street and a race car. What’s designed to keep you safe on the track can be your worst enemy on the street. Imagine getting broadsided and striking the cage seen here without a helmet on. For this reason, many chassis builders will shy a customer away from a full roll cage if the primary use of the vehicle is street driving. Said Giroud, “The roll cage that’s designed to save your life on the track is meant for an environment where you’re using proper safety gear — a helmet, harnesses, and everything else. You don’t want to put a person in unsafe situation by putting too many bars in it, because it presents what I would consider a more unsafe situation than too few bars on a race car. You don’t want to put a bar by the drivers head and then they get broadsided and hit their head on that bar and not have a helmet on. What’s there to save your life at the track can be your worst enemy on the street.” There’s no specific rule of thumb for track versus street split time, but if you’re doing a considerable amount of street driving, a roll bar might be your best, and safest, bet. Though not currently NHRA legal, RideTech offers a bolt-in, stainless steel roll cage known as the Tiger Cage that’s easy to install and form-fits a number of specific and popular early and late model muscle cars. Shown here is the complete Tiger Cage system, with a seat brace bar and door bars. For the muscle car crowd amongst us or for those looking for affordable and easy-to-install alternatives to the weld-in roll cage, the folks at RideTech offer their Tiger Cage stainless steel roll cage system. These bolt-in cages are pre-engineered and designed for specific makes and models, with patented clamp collar components that tie the cage to the structure of the car for safety and rigidity. And the best part is, you can install these at home in 4-6 hours using just three simple tools found in any basic toolbox. “The Tiger Cage is basically a modular, bolt-in, stainless roll cage system for muscle cars,” says Voelkel. Here, you can see the clamping system used to hold the Tiger Cage together. Although geared toward the muscle car and street crowd, this kit is in fact NHRA-legal for cars running 10.99 and slower. The Tiger Cage is sold in modules, beginning with a base 4-point roll bar containing a main hoop and two rear struts that will allow you to retain the back seat. Additions that include a door bar that are situated down low on the door can also be added for more structural support. Tiger Cage’s are currently available for 2005 and later Mustangs, ’67-69, ’70-73, and ’74-81 Camaros, as well as ’64-67 and ’68-72 GM A-Bodies and ’68-74 Novas. How Do You Find A Good, Quality Chassis Shop? The world wide web and magazines are your friend. Publications like National Dragster feature extensive ads for chassis builders and chassis manufacturers, and the use of web search engines like Google and Bing will turn up plenty of builders in your area. But chances are you don’t buy many things without trying them out first, or at the very least, finding out everything you can about the product beforehand. And the same applies to a roll bar/cage. So, if you really want to find a good, quality chassis man in your area, the best thing you can do is to visit the local track, take a look at some of the cars, and ask questions. Here, you can see a number of different roll cages installed in a variety of cars out of the Alston Race Cars shop. In addition to complete in-house chassis service, Alston also sells complete roll cage kits that are ready to notch and weld. “Without a doubt, going to the track and talking to people and asking who did their chassis or cage is the best way to go about it,” says Giroud. “If you see something you like, you can ask who did it, and how their experience was. Word of mouth is the best way.” After you’ve talked to the racers and asked the questions you’d like to ask, a visit to the chassis shop will often give you tell-tale signs of the service you’ll get. “I always tell customers to come to our shop, and then visit some others, and make a mental note of the cars that are in their shops, and then go back three weeks later and see how much work has been done to those cars. If they’re covered in dust and in the same condition as the last time, chances are your car is going to sit a while,” says Ruth. Manufacturers like Chassisworks, which make and sell components but don’t construct/install them, do have networks of chassis shops that use their products around the country, and in the example of Chassisworks, Wright relayed to us that they can generally find a customer a shop within 100 miles of their location. But again, the rule applies that asking questions at the track is always best case. With decreased racing budgets and an influx of tools commonly used by chassis shops more readily available these days, many racers today are taking on the project themselves in their own garages in increasing numbers. With easy and affordable access to tools used by chassis builders these days, more and more people are going the DIY route for installation of their roll cages. Alston Race Cars’ Mike Ruth cited a $49 tubing notcher available at Harbor Freight as a prime example of a tool plenty capable of doing the job at home. The cost to have a roll bar/cage varies widely from region to region, and a lot depends on which shop you have it done at. A one-man band that does chassis work in his sop on the side may be much cheaper than a full-time shop with dedicated welders and fabricators, with overhead costs and insurance. But don’t be fooled by presentation, as there are countless part-time chassis guys out there that do exceptional craftsmanship. As Wild Rides Race Cars’ Gene Giroud stated, I always tell people to keep in mind they’re not buying tires here, so don’t go price shopping.” The craftsmanship and level of service you’ll recieve will always play a pivotal role in how much you’ll pay for a roll cage, and as always, keep in mind that you do in fact get what you pay for. Seen here is a roll bar with a swing-out drivers door bar in a ’55 Chevy out of the Alston Race Cars shop. Like anything else, you get what you pay for in a roll bar/cage. Go to the track, check out the quality of the work you see, and compare prices amongst those shops. The ones that charge more may not always deliver the better product, and vice versa, the cheap shops aren’t necessarily rolling shoddy jobs out, either. Whether you’re on the hunt for a quality chassis shop to install your roll cage or you’re diving into the project yourself, the best thing you can do for yourself is take the time to do your homework. Consider how you’ll use the vehicle, both now and several years down the road. Weigh the cost versus weight debate, and decide what meets your needs. Again, the primary goal here should be keeping you safe regardless of your driving habits, and remember, you can never be too safe.